One kilogram of bodyweight is equal to about 7700 calories, meaning that if you use up 7700 calories you will lose one kilogram; conversely, when you accumulate 7700 in your body, your weight will increase by 1 kg. This means that controlling calorie is essential for people who want to lose weight. If you want to lose weight but haven’t fully grasped the “control diet” and “increase exercise” main principles, failure will come when success could quite easily be had. However, we shouldn’t lose weight too quickly, with the ideal weight loss 0.5-1kg per week, and no more than 2-4 kg per month, otherwise, after successfully losing weight, your weight can easily quickly bounce back. When everyone knows how to Calculate Daily Calorie Requirement, people who want to lose weight should try reducing calorie intake by 500-1000 calories; adding these together with the calories burned up doing sport, the length of time needed to lose one kilogram can be roughly calculated. 1. 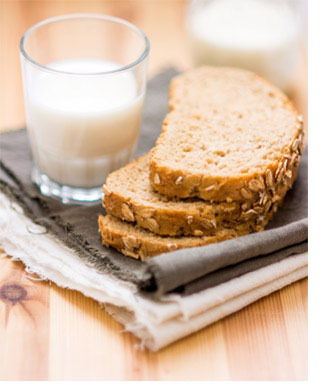 Increase consumption of whole grains. 2. Protein should come mainly from low-fat foods. 3. Eat mushrooms, bamboo shoots or fiber rich foods to increase the feeling of being full. 4. Eat fruit with skin on as much as possible. 5. Avoid eating foods with refined sugar or fried foods after sport. Sentosa nutritionist Chang Pei-rong suggests that people who want to lose weight increase their intake of whole grain foods, such as brown rice, 5-grain rice, or replace rice with sweet potato, pumpkin, Job’s tears or red beans, or add these to rice. These whole grains foods are not only rich in fiber, the Vitamin B they contain also stimulates metabolism. As for protein, mainly low fat foods should be eaten, such as chicken, goose, fish and shellfish, and bean products; as for vegetables, mushrooms, bamboo shoots or high fiber vegetables will increase the feeling of being full and delay hunger pangs;fruit should be eaten with the skin on as much as possible;if you are worried about pesticide residue, you can soak the fruit in water before washing and then wash it in running water to remove any residue. Correct food choice after sport is very important. Foods with high refined sugar content such a desserts, cakes and biscuits and fried foods should be avoided after sport. We suggest, after sport, you eat a suitable amount of protein food to allow muscle to be repaired and accompany it with some high fiber staple food, such as mixed grain bread, 5-grain steam bun or steamed sweet potato, to reduce blood sugar fluctuation and avoid excess release of insulin to prevent fat formation happening. In fact, if we don’t eat before we can easily lack energy during sport and the intensity and level of our performance will thus decline. If we don’t eat after sport the body, because it has lacked energy for a long period, will begin to break down muscle. When muscle mass decreases, metabolism slows, representing the lowering of the basic metabolic rate; also, when we eventually do eat, we might eat too much after being too hungry for a long time so the calories we consume will be actually more than the ones we have used up in sport. This is the reason many people take up sport but not only can’t lose weight, they actually put on weight. Therefore, if you want your weight loss plan to be effective, correct dietary concepts, complete diet planning and regular fixed amount of exercise is essential! Keen badminton players can also, depending on a player’s physical ability, consider doing some basic fitness training before playing;for example, 6-point footwork practice, practicing picking up the shuttlecock with the racket; this will strengthen specific muscle groups and increase basic metabolic rate, while also developing your badminton skills.